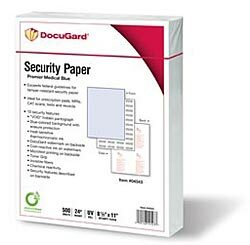 One Ream of 500 Sheets 24# Blue Security Paper includes the current Minimum Security Features required by Medicaid, and many other regulatory agencies. Deters fraud and assures authenticity. 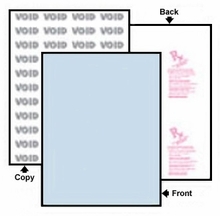 Pantographs of "VOID" are easily distinguishable across the entire sheet when duplication is attempted. DupliGard Security Paper watermark on the back stands out when scraped with a coin. A leader in the Sustainable Forest Initiative.